President Obama's address to the nation's schoolchildren has been called disruptive and uninivited by Minnesota's Republican Governor Tim Pawlenty. Florida Republican Party chair Jim Greer alleged that Mr. Obama is seeking to "indoctrinate America's children to his socialist agenda." Despite the criticism over what the White House has characterized as a motivational speech promoting the value of education, on "Face the Nation" Sunday, Secretary of Education Arne Duncan told CBS News chief Washington correspondent and anchor Bob Schieffer, "At the end of the day, if the president motivates one C-student to become a B-student or one student who is thinking about dropping out to stay in school and take their education seriously, it's all worth it." And, Mr. Obama is not the first president to address students nationwide. In 1991, President George H.W. Bush gave a speech to schoolchildren across the country. "Every time you walk through that classroom door, make it your mission to get a good education. Don't do it just because your parents, or even the President, tells you. Do it for yourselves. Do it for your future," Mr. Bush told the children. The text of President Obama's 2,438-word speech (see below), which will be given on Tuesday, doesn't appear to make any political waves, despite warnings from one conservative pundit that the speech would demonstrate a desire to use schoolchildren as "guinea pigs and as junior lobbyists for their social liberal agenda." In the speech, Mr. Obama asks schoolchildren to stay in school and fulfill their responsibilities to themselves and the country. 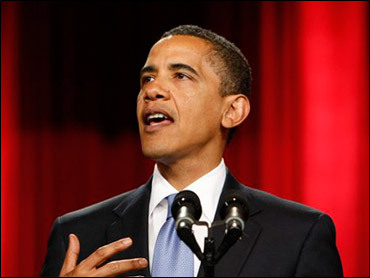 The following is the prepared text of Mr. Obama's speech to students to be delivered in Arlington, Va., on Wednesday, Sept. 8, 2009, which was posted in advance on the White House Web site. The President: Hello everyone - how's everybody doing today? I'm here with students at Wakefield High School in Arlington, Virginia. And we've got students tuning in from all across America, kindergarten through twelfth grade. I'm glad you all could join us today. I know that feeling. When I was young, my family lived in Indonesia for a few years, and my mother didn't have the money to send me where all the American kids went to school. So she decided to teach me extra lessons herself, Monday through Friday - at 4:30 in the morning. W.H. : School Speech Criticism Reflects "Silly Season"
That's why today, I'm calling on each of you to set your own goals for your education - and to do everything you can to meet them. Your goal can be something as simple as doing all your homework, paying attention in class, or spending time each day reading a book. Maybe you'll decide to get involved in an extracurricular activity, or volunteer in your community. Maybe you'll decide to stand up for kids who are being teased or bullied because of who they are or how they look, because you believe, like I do, that all kids deserve a safe environment to study and learn. Maybe you'll decide to take better care of yourself so you can be more ready to learn. And along those lines, I hope you'll all wash your hands a lot, and stay home from school when you don't feel well, so we can keep people from getting the flu this fall and winter.